The past two weeks have been scattered. Finishing my last semester of graduate studies has freed my schedule and thoughts for all things nonacademic, but the last few months of driving towards this arbitrary end point has left me drained, and disappointed, as churning out research papers at this stage is a flush of invigorating thoughts that never receive the process time deserved. Topics may be more complex and challenging at their best, but any actual exchange of ideas moves much slower in the academy, and more often than not, dialogue is directed backwards where the production of ideas is reactive rather than self-generative. Education is not for naught, of course, but it has become crystal clear that there is a far more prominent lineage underlying all thought production in the academy, a lineage that constructs the very walls that it then proceeds to methodically tear down. Needing a palette cleanser, I headed out to Vancouver for an extended weekend, where, much to my surprise, I spent an afternoon in an art gallery with my mother. Possibly for the first time in my adult life, we did something cultural together that was beyond going to the movies. Arts and culture were never a topic of conversation growing up; rather, arts and culture were simply regular activities around the house on equal footing with everything else from walking the dog to cleaning up after yourself. Music lessons and art classes were standard chores; visits to galleries and museums were best left for school field trips. Drifting up the floors of the Vancouver Art Gallery and watching and listening to my mother’s present-day reactions to everything from Kyla Mallet and Germaine Koh to Claude Tousignant and Rodney Graham, I came to suddenly (and finally) realize where my skepticism comes from and how my reactions are provoked. Although our tastes and standards differ vastly, we share a similar approach in wanting to be convinced and engaged in a manner that approaches art as part of the everyday. The day after getting back into town, urgent messages and updates about Edmonton arts writer and radio broadcaster Gilbert Bouchard began appearing all over the web, mostly through Facebook statuses, but then in emails, news links, and search groups. His sudden disappearance has ricocheted shock throughout the arts community, as he was one that covered it all and was always everywhere. In terms of local lineage, Bouchard is the predominant figure ahead of myself and the peers of my generation. As a voice for the visual arts in the city, I don’t remember reading anyone before him. Over the years we crossed paths numerous times, but I can’t say we ever spoke much to each other. Why we never did is what keeps spinning in my mind, as there are only a small handful of arts writers around who work and understand that particular brand of the freelance writing grind. Networks of support only exist if you build them. Throughout the afternoon of the community search, even though I rationally knew we were just doing a general sweep of an area, I couldn’t help but keep wondering if he had actually walked down this exact path. I could only keep looking ahead as our small group wandered through a section of the immense river valley looking without knowing what we were actually looking for. I am not really a movie buff. I’m not. I can’t quote famous movies; I can’t recognize famous actors; I can’t really even think of the last time I went to see a flick. It’s a source of shame and embarrassment for me in many ways – believe me. It’s also probably why I don’t know a lot of information about FAVA (Film and Video Arts Society of Alberta), whose mandate is to promote film and video arts in Alberta. However, what I can tell you is that as someone who works almost exclusively with two-dimensional imagery and techniques, I am pretty intrigued by moving pictures – that is, using film and video to create an environment that doesn’t necessarily include a linear narrative. Which is why, when I learned that Lethbridge-based David Hoffos and Edmonton's own Christopher Payne were holding a video installation course at FAVA, I was interested in checking out how people use the mediums of film and video to speak to their viewers. And it’s also why I think it’s great that the workshop participants were given the excellent opportunity to showcase their short experiments in the Front Room space at Harcourt House, which opens up the world of FAVA and experimental video arts to the public. The Waiting Room exhibits the video-based experiments of the five workshop graduates: Maya Jarvis, Conor McNally, Heather Noel, Aryen Hoekstra, and Malorie Urbanovitch. Upon climbing the many stairs of the Harcourt House building, I noticed a sort of projector-type object pointing towards the outside window, onto the street. Turning around, Malorie Urbanovitch’s moving image of a man endlessly climbing a ladder projected onto the night sky (with help from a sheet of frosted mylar) shocked me a little, but in a good way; the work is an excellent example of how just the simplest of images can be made uncanny, unexpected and unreal when they are moving. Video installation gives the artist the opportunity to play with the viewer’s point of view in ways that motionless work just can’t offer; it can create an environment that we recognize as closer to our own reality (since our reality is never completely still). I was excited to see more. The Front Room space of Harcourt House has dimmed the lights to provide an eerie and necessary backdrop for strategically placed portions of projections, video, props, and sound. The first work in front that catches your eye is that of Maya Jarvis, who allows us glimpses into family histories inside a monitor cleverly masked as a picture frame with her piece, "Family Grace". It seems Jarvis is attempting to create a sense of passage of time as well as the idea of family rituals (such as sitting around the table together for a meal) as stagnant and unchanging in our memories. Around the corner, Conor McNally invites us to experience snow plowing and cellos on an entirely new level in "Be Heldscalla". The work reads like a narrative of repetitive actions as well as illustrating the concept of disorientation; throughout the piece, you are not entirely sure of exactly what the image is in front of you. Heather Noel’s "Water Vs." uses a fish tank, complete with gravel, rocks, and plant life, as a looking glass – you peer down into the top of the tank to witness another world as projected from below the clear-bottomed container. The video beneath portrays a more vivid, animated version of a fish tank than the dormant one which hosts it, providing an interesting duality which asks the viewer to decide which “reality” is more alive. Malorie Urbanovitch’s second work in the show, "The Count", suggests the viewer to sit in a chair in front of a television that flashes consecutive numbers counting up from one in an erratic and random manner. It seems Urbanovitch is playing with our sense of rhythm here, which forces the viewer to surrender their themselves to the whims of the random count. This holds our attention throughout the duration of the video as we are held in suspense over how the count will reveal itself. Aryen Hoekstra’s "The Bathers" conjures a sense of creepy motel shower stalls while water flows peacefully away down a drain, projected from behind onto a sheet of glass. Hoekstra certainly succeeds in creating a confusing and slightly uncomfortable environment for the viewer; our natural inclination as human beings is that of curiosity, and this piece has no shortage of objects to look behind and things that are hiding. While I was enjoying the sights and sounds of the gallery, I spoke to Deanna Kayne, programming coordinator at FAVA, about the workshop. She was very enthusiastic about the outcome. She also noted that while setting up at the gallery, proper installation tactics became paramount; the participants had to consider each aspect of how their works would be viewed, which included placement concerns and site-specific obstacles, right down to hiding cords and plugs to create as seamless an environment as possible. The exhibition isn’t polished or perfect. The works are clearly not final statements. Rather, this show is meant to be a kind of question mark; it’s the product of experimentation and collaboration with people from several different backgrounds (artistic or otherwise) to see how they can manipulate one’s sense of space and reality through the use of video and installation. As well, the participants themselves had little to no experience with video or film technologies; for all, it was the first time they had attempted to express themselves through moving images. Regardless, the exhibition shows us something really crucial: the fact that moving imagery – be it through film, video, projections, animations, or otherwise – is an exciting and volatile medium that is available to basically anyone who has an interest in creating these dynamic environments. Last time, I ended abruptly on the note that for "those who choose to stay and create, they need to be nourished, and that means growing both the work and the audience by injecting new and challenging works alongside the existing status quo instead of simply defaulting to elsewhere." Breaking this down further, I find two major hurdles. We have yet to generate an ability to contextualize works within a critical, or even an appropriate artistic framework. That means there's been no distinction made between challenging provocative works and safe status quo works in terms of audience development. Everything is grouped under the umbrella of "culture," which is accurate on the surface level, but there are certainly variations within the rubric of culture that should be distinguished. I missed this year's Mayor's Evening for the Arts, but I heard plenty about the lineup of activities. Ranging from the comedy cover band the Bea Arthurs, to the interdisciplinary choreography of KO Dance Project, to some unknown man with a guitar, the line-up sounded all-too-familiar: a cross section of artists from Edmonton, assembled together for the broadest demographic possible, who come out to support and partake in culture, but who are not expected to think about the works individually—the work is merely to be enjoyed as part of your day or evening out. From marketing to execution, one look at the city's arts listings and you would think everything is being produced for one lump dose of public consumption. There is no target audience, no real nourishment, no killer—just filler. The second and entirely related hurdle: we are the first to censor ourselves. We don't think anyone wants to be challenged out of their comfort zones because we're never challenged out of our comfort zones. If anything seems inaccessible or potentially provocative, we either dismiss it or apologize the hell out of it. But comfort zones are perpetuated by those who cater to its standards by presupposing and upholding its expectations. I spoke of Toronto performance artist Jess Dobkin in the last article as simply "bittersweet," but I should go into a bit more detail. Dobkin performed two pieces at the Edgy Women Festival, "It's Not Always Easy Being Green" and "Mirror Ball"—the latter being an embodiment of a human disco ball, set to the pulsations of Bowie's "Let's Dance." Highly physical, yet extremely vulnerable, the piece stretched our perceptions of the boundary between the intimate and the spectacle, and was certainly one of the most effective live works in terms of generating new perceptions of how we engage with bodies. "It's Not Always Easy Being Green," however, also tested that line between physicality and vulnerability. Dobkin appears naked and sitting lumped centre stage on a stool as the Muppets theme song plays on a loop. She is completely painted "Kermit" green with even the Kermit collar, all except for a pubic triangle, left untouched. Already as is, it's a good image. Lex Vaughn, costumed as Jim Henson, then comes on stage, all the while with the Muppets theme song still playing, "Jim" circles "Kermit" a few times, pulls out one rubber glove from his breast pocket and puts it on. With slow deliberate gestures, "Jim" then takes out a small bottle of lubrication and meticulously lathers his one rubbered gloved hand. "Jim" sits down in front of his puppet and inserts his hand up to the wrist. The music stops. "It's Not Always Easy Being Green" comes on through the speakers and the puppet comes to life. Kermit, and sometimes Jim, lip synch to the whole song, with hand intact, and they bow and leave the stage together, with hand intact. Unabashedly, this was simply one of the most fearless pieces I've possibly ever seen. It was smart, shocking, and sweet all at once without the pretension of trying to shock. In fact, it was probably the lack of self-censorship and pretension that was the most shocking part (along with of course actually seeing Kermit getting fisted live in front of you). Would I have ever seen "It's Not Always Easy Being Green" in a generic, catch-all arts festival? Absolutely not. That work could not be shown without context. And unfortunately already, without people even seeing it, the description of the piece has spread like wildfire in Edmonton as part of some "crazy lesbian feminist performance art festival." Reductive, intimidated, and very possibly accurate, there still needs to be room for that to exist if people actually believe and want to support and partake in this concept called culture. When Raphaëlle de Groot put out a call for objects that “you no longer need or want, and items that have become a burden,” I was fascinated, but entirely unsure of what I would find in her collection. Arriving in her space at the Southern Alberta Art Gallery, de Groot’s collection of unwanted objects entitled The Burden of Objects immediately took on a persona, creating a portrait of the community by providing a rare view of objects people had invested with emotion or fell obligated to hold onto. Existing somewhere between the things we use everyday, the things we treasure forever and the trash we part with gladly each day, the objects Montréal artist de Groot has received occupy a materialist limbo. It is precisely the absence of necessity, love or disposability that makes these objects both specific and revealing. Many of them contain a spark of recognition, as if they could have been mine fifteen years ago, magically transported from dusty basement to art gallery. De Groot has relocated to Lethbridge from Montréal for four months to begin this project. For this duration she will be SAAG’s Artist in Residence, collecting objects from the community, arranging them in a space at the gallery and hosting various events to encourage the public to re-arrange and interact with the objects. Over the past ten years of her practice, de Groot has undertaken some ambitious projects, from working on the design of the Square des Frères-Charon in Montréal to collaborating with nuns in the piece Dévoilements. Her work refuses to be constrained to a single medium or working method, and takes immense strength from this uncompromising pursuit of ideas. Not wanting to distance myself from the process by not participating, I hand over my personal contribution to de Groot’s collection; a dress too fantastical to be worn in public again. I am asked to fill out a questionnaire detailing the origin of the dress as well as its significance to me. Initially I think that de Groot is interested in this information for its own sake, but later I suspect that she is documenting the origins of the objects she collects because once they become part of her collection, the history they carried with them will fall away. Liberated from their past, the items will take on new meaning as they are rearranged and re-contextualized. 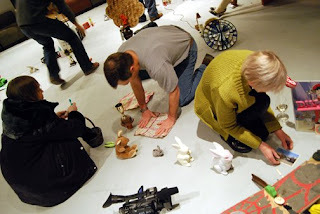 This strategy of incorporating any objects that are brought to her, as well as having visitors to the space freely rearrange the objects, takes some of the power to direct the meaning of the work away from the artist. In this respect, I think de Groot’s piece illustrates some of the ideas of Italian writer Italo Calvino in his 1967 lecture "Cybernetics and Ghosts". In it he argues that the reader holds the important role of creator, finding meaning by relating the symbols present in a story, while the writer on the other hand is a robot, ceaselessly combining any and all symbols present in a culture. More and more, artists such as de Groot are stepping away from narrating a single meaning to the audience, and are instead taking on the role of guides, instigators and caretakers. One of the initial draws of this exhibition, hinted at by de Groot’s call for burdensome objects, was the possibility that abstract qualities such as love, devotion, rejection or resentment could be transferred physically into objects. Was it possible that in her collection I would be able to see traces of love and abandonment in the possessions people where surrendering? It was of course a long shot to believe that the emotions of the objects’ owners would somehow make themselves visible. Other than their dated nature, there is no particular evidence of the objects’ burdensome relationship to their owners. The physical identity of the objects is the sum total of the burden. The collected objects are, however, oddly melancholic; discarded toys (mainly rabbits) and small broken electrical appliances populate the space, objects that have been overlooked and neglected for a long time before being surrendered into de Groot’s collection. Stacked one on top of each other inside the gallery space, the piles of objects become organic sculptural forms hanging off the walls or pushing out of the floor. De Groot initiated many of the arrangements herself and often rearranges things, but she encourages visitors to take the principal role in arranging and building with these objects, again allowing some kind of collective community identity to manifest itself in the project space. 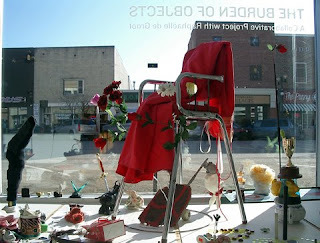 Image credit: The Burden of Objects, collaborative project with Raphaëlle de Groot, view of the open studio, Southern Alberta Art Gallery, 2009. Photo: Raphaëlle de Groot. The ebb and flow of the work, as it is constantly being added to and re-arranged by visitors, becomes one of the difficulties of describing the piece. The Alice in Wonderland-like state in which I saw it, populated with many toy rabbits and fake flowers, the most frequently donated items, has no doubt by this point transformed itself into an altogether different narrative. However, while the feelings of their owners may not have directly altered any of the objects, the collective identity of these objects does hint at certain characteristics, characteristics we pick out to love or represent our affection to others who soon loose interest, or that initially fascinate us with the promise of usefulness but instead quickly become superfluous. Toys and decorations are mainly saccharine and overly sentimental, while the abandoned electrical appliances seem to promise the future, with a certain space aged appeal. De Groot has plans to continue the piece in other locations, including Italy, and it will be interesting to see how overall qualities of burdensome objects change as different communities contribute to the piece. In the work’s collective identity, infinite narratives are present in the ever changing accumulation of objects, each item representing the starting point of a story that connects each visitor to the previous participants. In contrasting to this, in a more material sense, as the weight of ownership for each object is transferred to the artist, the meaning becomes the singular story of the power objects have over their owners, very literally demonstrating the physical burden of accumulated objects. Eight easel-sized, vibrantly patterned paintings float and flicker on the walls at Herringer Kiss Gallery. These dynamic, super-saturated works by Christopher Willard demand a closer reading. Image credit: Christopher Willard "IMPOSSIBLE TO OVERLOOK" 2009. Courtesy of Herringer Kiss Gallery. 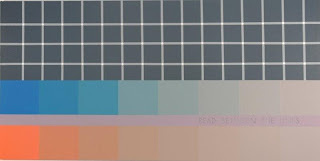 A meticulous two-colour grid of squares appears along the top horizon of each acrylic painting. Small dots of white paint are precisely positioned at each intersection of overlapping lines. The grid shifts with a blink: its painted dots momentarily vanish and then reappear as the complement, or opposite colour of the adjacent grid. Blink again, they return to white; blink once more, the cycle repeats. These small dots fleetingly taunt and titillate the eye. They signal the experience of seeing. They create an over-abundance of visual stimuli, fatiguing the eye-brain system and causing perceptions to seemingly disintegrate and regenerate before our eyes. Whether the science of visual phenomena is clearly understood or not, Willard reminds us that “it isn’t what you think”. His work functions as what Gianni Vattimo calls a novum, a common horizon in which two interlocutors (paint and word) present themselves as something new. Willard approaches Contemporary Geometric Abstraction by expanding on a long and rich lineage. Recall the early 20C paintings by Kasimir Malevich and Piet Mondrian; the mid-century Op-Art and Hard-Edge works by Victor Vasarely; the Neo-Geo movement of the 1980s with contributions by Peter Halley, and the witty Conceptual paintings of the late 1990s by Richard Prince. Willard employs essential elements from Optical Art to achieve the effects seen in his fluctuating grid patterns. His structural, or presentational approach is located at the lower portion of each painting where he arranges larger coloured squares. In some compositions the hard-edged squares grow progressively more colourful as they head toward the middle of the painting. In others the colouration of squares is less intense but deliberately lead the eye across the picture plane toward the edges. All squares are surrounded by a background of contrasting colour that emphasize the overall rectilinear format of painting. In contrast to the precise applications of paint on the surfaces, the edges around the outside margins of the paintings are over-spilled with bits of paint. This shows the hand made quality of his painting process, evidence that these works are not repetitions of the industrially fabricated art of the mid-20 century. Image credit: Christopher Willard "READ BETWEEN THE LINES" 2009. Courtesy of Herringer Kiss Gallery. His final touch are aphorisms neatly engraved into the surface of each painting. The inscribed words expose the raw Plexiglas panel that is the substrate of the painting. These captions are both literal and visual impressions. “IT ISN’T WHAT YOU THINK”, “READ BETWEEN THE LINES”, “SOMETHING TO LOOK INTO”, prompt double entendre readings. Multiple interpretations are made possible. It is clear that Christopher Willard articulates fresh contemporary painting at its best, transforming how we read works of art. partly informed by this collaborative relationship. For as long as I can remember, since trolling around on the inefficient Edmonton public transit system from nowhere north side to dead end west end as a preteen, since brooding year after year about remaining in Edmonton for another year, I too had always harboured the urge to leave. And not leave to just anywhere in particular, but specifically, I, along with legions before and after me, wanted desperately to move to Montréal. La belle ville. Where you can seemingly live cheaply and freely forever. Where you can’t spit without hitting an artist. Where you can ride your bicycle everywhere and partake in an array of everything any day and any night of any week. The years went by and I never did leave. At least not for Montréal. Never finding the pull strong enough or the push great enough, I ended up back where I started to try again. But since those early days of dirt city angst, I have watched legions come, leave, return and leave again, perpetuating a rhythmic lulling cycle. Last week, I finally dropped into Montréal on a research visit to witness Studio 303’s Edgy Women Festival. The curation of multidisciplinary performance works by Miriam Ginestier was certainly inspiring in scope and variety, with highlights including choreography from Chanti Wadge as performed by Isabelle Poirier, bittersweet performance artist Jess Dobkin, the always electric eclectian Alexis O’Hara, plus Edmonton’s own Kristine Nutting’s scaled-down remount of Pig. The 100-capacity theatre at Tangente was packed each night, and Nutting’s show brought out one ex-Edmontonian after another, who came out to see her Prairie gothic performance in Montréal. As the only Canadian artist representing west of Toronto, Nutting reaffirmed for me that our fetishization of elsewhere neglects to acknowledge what we already have brewing in our own backyard. Working in a city like Edmonton demands infinitely more self-directed focus, and the trade-off is more process time for those who are committed. There is less of an expectation to persistently churn out more work; in fact, it has become clear that you can only viably create one or two works a year, in whatever medium you work in. Checking out the visual arts scene during the day and touring the endless galleries in the Belgo building, hitting the Musée d’art contemporain de Montréal, DHC/ART, La Galerie Centrale and other spots, it proved that within Canada more does not equal better. The ratio of quality work to unprocessed works remains level in proportion, and so the result is seeing a ton of bad art with a few gems, most of which was created by artists from elsewhere. You really can’t walk without tripping over an artist of some sort, and most likely they’re riding their bicycle to one of the many free or affordable cultural events that everyone from all ages seems to attend in passionate droves. Everyone is creative, almost all of the time; but there, like here, like most everywhere, is a vacuum unto itself. That vacuum is important for generating works specific and conscious of their environment and communities, as that becomes the cultural hallmark of any place; but for those who choose to stay and create, they need to be nourished, and that means growing both the work and the audience by injecting new and challenging works alongside the existing status quo instead of simply defaulting to elsewhere.